My name is Stacy Ford and I am the Teacher-Librarian at The John F. Kennedy Elementary School in Norman, Oklahoma. I have been an educator for 11 years. Four of those years were spent as a middle school social studies teacher and the last seven years I have been a Teacher-Librarian. My current school serves approximately 450 students in grades Pre-K through 5. Our free and reduced lunch rate is approximately 90%. An important feature to note for our upper grades (3-5) is there is pretty much a 1:1 student to Chromebook initiative which allows for ample technology integration for our units. The school library operates on a fully flexible schedule. My schedule allows me to meet with whole groups, small groups, pull out students and push into classes as planned with teachers. Currently, Kennedy is under construction and the library is under major renovation, where we will have walls for the first time since the building was constructed in 1968! On a personal note, my wife Erin and I have two kiddos on the ground, ages 3 and 5, and a sweet girl that could be wheels down at literally any moment. They keep us busy with trips to the local sno-cone stand, public library and right now to any pool we can get into. As a Teacher-Librarian I was introduced to Guided Inquiry Design by our district library coordinator, Kathryn Lewis, in the 2014-2015 school year. 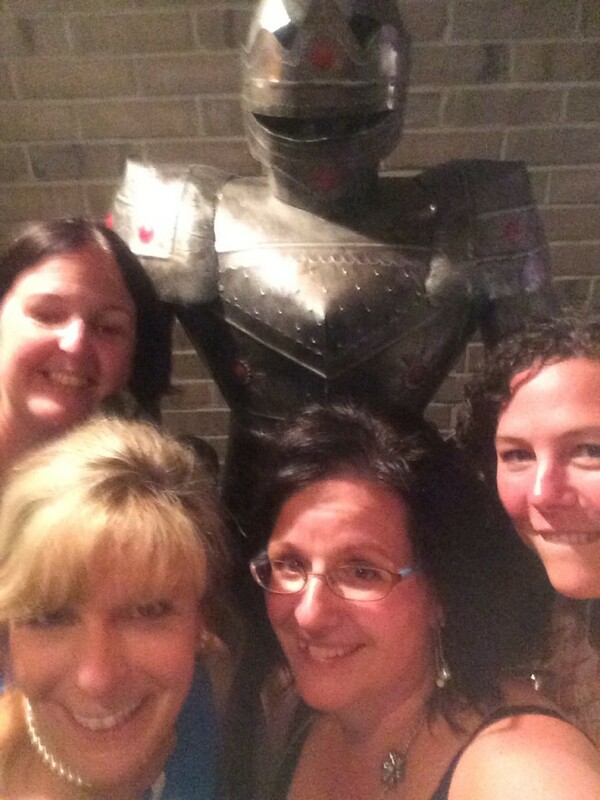 I participated in a Guided Inquiry Design Institute in the fall of 2015. Prior to these experiences I was introduced to Kuhlthau’s Information Search Process during my M.L.I.S graduate program at the University of Oklahoma. My school district has been very supportive of the Guided Inquiry Design process by sponsoring multiple GID institutes and having school librarians lead workshops at district and state conferences. Most importantly, teachers and principals are being brought into this process alongside librarians, so that Guided Inquiry has not become a “library thing,” where Teacher-Librarian’s are expected to be the expert and implement everything. This has allowed for TLs and the Teachers to develop better working relationships and a greater understanding of each others role in the instructional process. As a classroom teacher my students were consistently involved with research projects. Through my work with my school librarians I began to make these research projects better. However, they still revolved around a rubric checklist of items, not authentic inquiry questions. In my role as a teacher-librarian I would say that I have worked with teachers on authentic research projects, that is to say, not simply reporting information the majority of the time. However, I would admit to working with teachers to assist in the reporting of information in my current practice as well. The thing I love about Guided Inquiry, and what my school district is doing is that it lets me teach how I have always wanted to teach. By teaching the way that I want to teach, I mean to say that I allow students the opportunity to research content related information to create knowledge in an authentic fashion. Along, the way I am able to practice best teaching practices by allowing students to reflect on their learning and make connections with each other based on content. This week I will be referencing two different Guided Inquiry Design prototype units that I have conducted with teachers and students at Kennedy. I call them prototypes because they were not perfect examples, but I learned from both of them and the units I have since designed with teachers have benefited from the missteps our teams have made before. Back to the units I will be discussing. One of the units will be a 3rd grade unit where students were focused on studying animal classification and the other was a 4th grade Native American unit. There are specific things I love about each of these units and there are things I will redo when we implement them again. I’m looking forward to sharing with you this week! We’re having summer here in the US and lots of professional development in GID. As I mentioned in my last post, this week was the fourth GID institute in Norman Public Schools. Because of the size of this district and the way Guided Inquiry requires a collaborative team, the librarians at each school have attended one GID institute this year. But because many have teachers who now want to join the fun, the librarians are attending the institute a second time to come with their teachers so they can participate as a collaborator. As you all know, we believe that the school librarian has a critical role to play in the Guided Inquiry Design team. She is the information specialist/professional as well as the information literacy teacher. These are two cornerstones to GID a. that information literacy is valued by all team members and taught (Kuhlthau 2004) and b. when students are locating, evaluating, and using information to learn, the information specialist is a key player. In the institute teachers in collaborative teams design a unit of study. By doing that, they engage in the inquiry process themselves as design requires you to identify the concept of the unit prior to determining the activities that would support students to arrive at their own questions around that concept. So, teams are going through their own inquiry during the institute. We know that all people going through inquiry can use guidance, and that the strategy of conversing is a support to the process. Maybe stemming from my background of five years as a teacher effectiveness coach in Denver, I have made coaching an integral part of the GID institute. Typically, I coach each teams during the institute on their units to help them stay on track, answer any questions and push their thinking to move beyond their known ways of doing things. This institute included double the number of teams than I could handle coaching in the time we had. So, we decided to have the librarians who had been through the training before get some further training on how to coach teams and then give it a go in this institute. As a result, this wonderful energetic and brilliant group of librarians who have now proved their accomplishments with the process and implementation of GID took on the role of coach in our June 2016 institute. I want to thank them for their dedication, passion for the work and professionalism in learning with me and coaching their colleagues. This is the beginning of something bigger and growing GID to help districts build capacity in the future. Each district might have a different way of handling this, but for me, it is exciting because I think that the role of coach is another great role for librarians. They are already really good listeners, and work with so many teachers, so collaboration and leading collaborations is natural to them. Also, as they use the process over and over with different grade levels and content areas, the GID process begins to become internalized, and that is what you really need to understand well in order to coach a team in GID. I’m excited about the prospect of GID coaching, and this stellar group was a wonderful place to start. Here’s a picture of our first GID Coaches! There will be more trained in July. As a result of their coaching, we had 20 excellent prototype units come out of this week’s institute. 10 at the elementary level and 10 more that the secondary level. 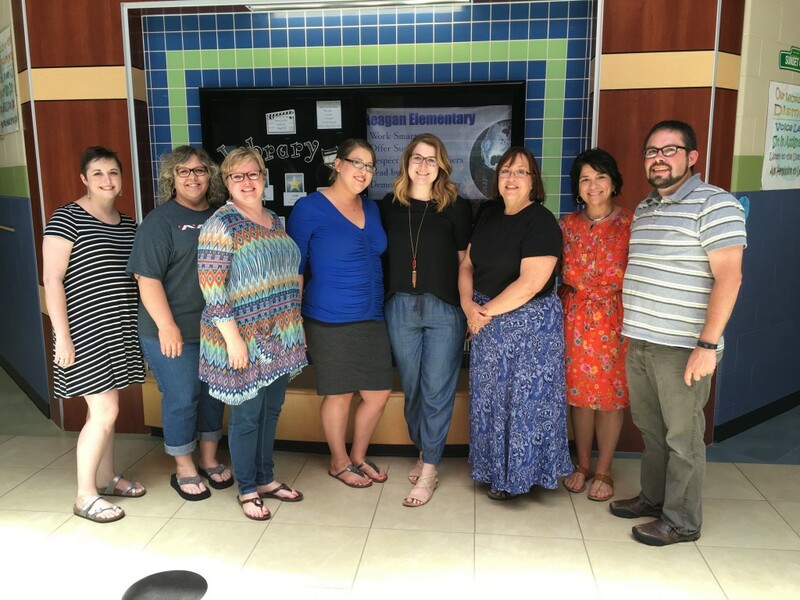 Typically an institute can only handle 10 units, so these educators efforts doubled the impact of this professional development for Norman Public Schools! Kudos! The Celebrations and presentations of the units were fantastic. More on that in my next post! Hello from Westborough High School, Westborough Massachusetts! In the early days of teaching, I learned quickly that letting students ask questions – that I didn’t know the answer to – was a sure way to keep curiosity an integral part of learning – for students as well as their teacher. As a library teacher, I have always looked for engaging ways to infuse this questioning into the research process. I became very interested in inquiry based teaching strategies that allowed students to delve deeply into a topic of their choice very early in my career. My true experiential teaching with inquiry began with middle school students on a fixed library schedule. The schedule gave the opportunity to work closely with these students, their thoughts, and their research journals. I created “research stations” that moved them through the process of research at their individual pace and ability. 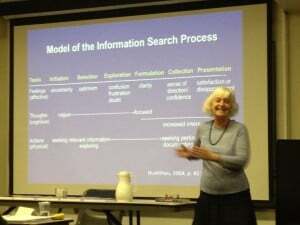 I had learned about Carol Kuhlthau’s Information Search Process, among others, in a graduate school and enjoyed putting these processes to the test with my middle school students. Fast forward a few years, to my current position as Library Teacher at Westborough High School. Again, looking to bring process to the practice of research, I continued to delve into inquiry based teaching strategies and to promote curiosity, engage students in asking questions, thinking critically, and solving problems. As teachers approached me with projects, I probed for projected outcomes and discussed with colleagues about the shift that could happen with this type of learning. When the opportunity arose to apply for the CISSL Summer Institute at Rutgers University, I knew that we needed to try for a spot with a team from WHS. I was able to gain the trust of Marci D’Onofrio (a science teacher), Kathy Stoker (an English teacher) and Carol Cavanaugh, (the assistant principal at the time) to apply to become a GID team. 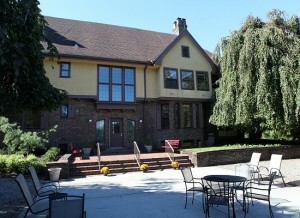 The Institute was instrumental in shaping our pedagogy around inquiry. Hello from Norman, Oklahoma! My name is Terri Curtis, and I am currently a library assistant at Whittier Middle School. First and foremost, I’m a mother to three fabulous teenagers. I know what you are thinking. Did I actually use fabulous and teenagers in the same sentence? Yes, I did. I genuinely like teenagers, and I’m kind of partial to the ones with which I share a home. This is the end of an era for my family as it is the last of 9 consecutive years with a middle schooler in my house. In that 9 years, I’ve learned a few things. Kids have a lot of important things to say and want to be heard… just like adults. Their feelings and emotions are very real. There is no point in buying new carpet until everyone moves out. They don’t all think and process things the same way. Don’t ask them what they think if you aren’t prepared to listen to an honest answer. I truly love this age of child, both as a parent and as an educator. I get to laugh every single day, and I look forward to seeing my home kids and my school kids as often as humanly possible. 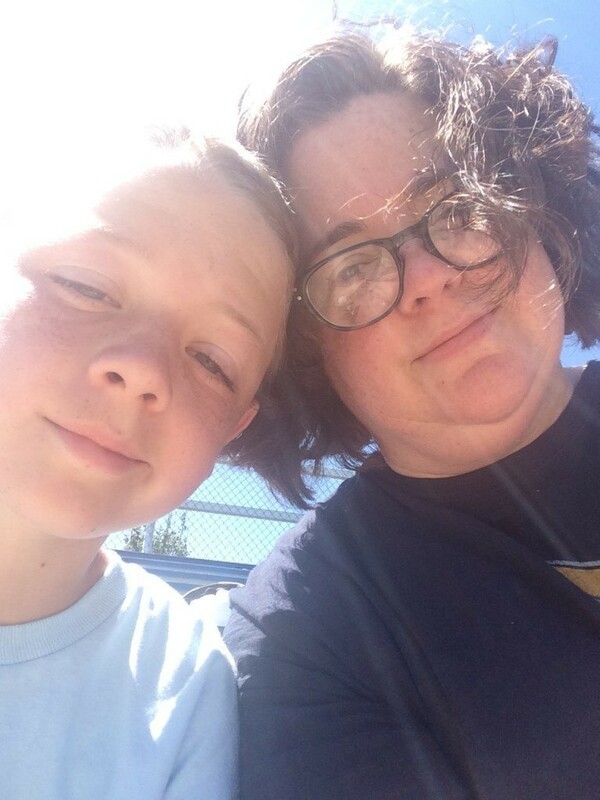 This is a picture of me with my favorite middle school student. He also happens to be my son. In my early parenting years, I got a bachelor’s degree in early childhood education. I used this degree while serving as a director of the preschool in my church. Once my children got a little older, I decided to head back to school to get my MLIS degree. I graduated last December, and I’m excited about the thought of having my own library in the future. As a library assistant in a middle school in Norman, I’ve been lucky enough to be exposed to GID. This past school year, our district sent many teams to GID training, and I was happy to have been included. 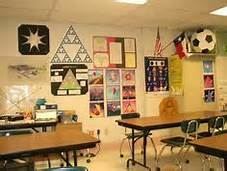 I’ve been involved in planning and implementing a few units at the middle school level. I’m excited about GID and the authentic learning that happens when a team of educators collaborates to design and facilitate inquiry-based units for their students. We truly hold the key to raising a generation of thinkers.